The Arc de Triomphe, the Moulin Rouge, the Eiffel Towerthere is so much to do and see in the colorful city of Paris. From graphic designer Misti Kenison comes an adventurous new board book for your toddler. The culture and monuments of France are rendered into bold, graphic illustrations accompanied by vocabulary to teach toddlers basic colors. 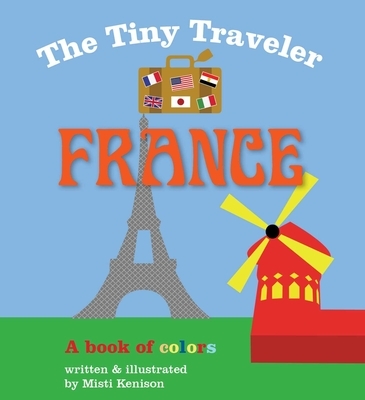 Traveling to foreign places has never been so colorful, or educational, for young children before! Each book in Misti Kenison’s new Tiny Traveler board book series is sure to give your child the travel bug early by transporting little ones to exotic and fantastic places while teaching basic conceptssuch as colors. Now you and your little one can explore the world together from your living room. Misti Kenison is a web/graphic designer and owner of MK Design. As a new mom, she believes strongly in encouraging literacy at a very young age, and hopes that this series will be a great tool for other parents to do so as well. She lives in Little Rock, Arkansas.